Fall is a great time of year (although DC has been jumping back and forth between summer and fall weather lately). You can get your fill of fresh, crisp apples and gobble up lots of pumpkin. I wanted to try an autumn-inspired pasta dish, and this one won out today. 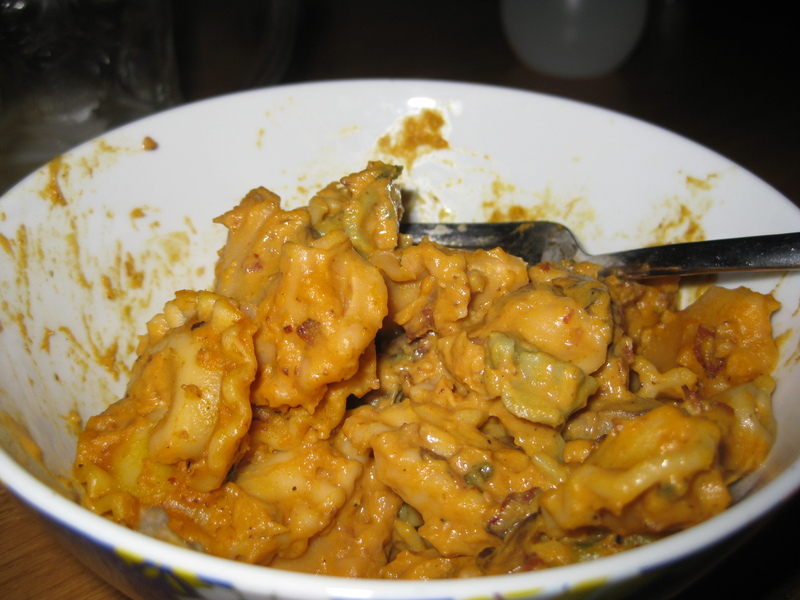 It’s hearty and comforting with all sorts of flavors you love from pumpkin to mushroom to sage. Season a large pot of water with salt for the pasta and bring to a boil. Prepare according to the pasta directions, stopped about 2 minutes shy of al dente (the pasta will continue to cook in the sauce later). In a large, heavy skillet, melt the butter and saute the mushrooms until starting to turn golden. Add 1/4 c white wine and season with salt and pepper. When the wine has cooked off, remove the mushrooms and reserve in a bowl. In the same skillet, heat the olive oil over medium heat. Add in the onion, garlic and pancetta. Allow to brown until the pancetta is nice and crispy. Stir in the chicken stock to deglaze the pan. Mix in the pumpkin. Stir in the cinnamon, nutmeg and mustard. Whisk in the marscapone and Parmesan. Stir in the mushrooms. Season to taste with salt and pepper. Add the other 1/4 c white wine and allow to simmer until sauce is bubbly. Mix in the cooked pasta. Enjoy! This makes a great dinner or a wonderful party snack. If you use endive leaves for “cups,” your guests will be able to pick up the little spoons and enjoy easily! I modified this from a Rachael Ray idea to cut back on the added sugar. I also used twice the celery as she did and cut out the shredded carrots. Heat the olive oil over medium-high heat in a large, non-stick skillet. Add the chicken and break up slightly; allow to cook 5 minutes. Mix in the celery, onion and garlic. Continue cooking another 8 minutes, stirring occasionally as the mixture begins to brown. In a medium mixing bowl, combine the vinegar, Worcestershire, hot sauce, tomato sauce and stock. Stir the sauces into the chicken mixture. Simmer for a few minutes until the sauce is reduced to the desired consistency. 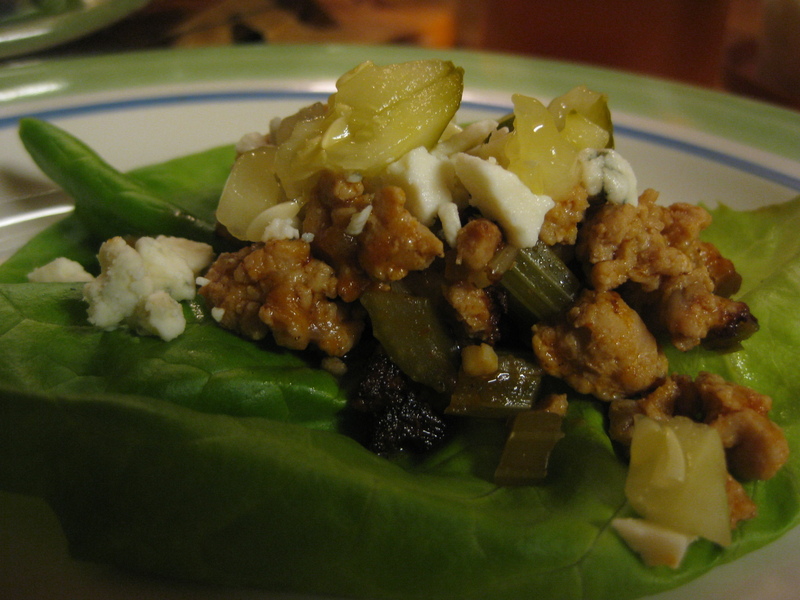 Serve with the blue cheese and chopped pickle. 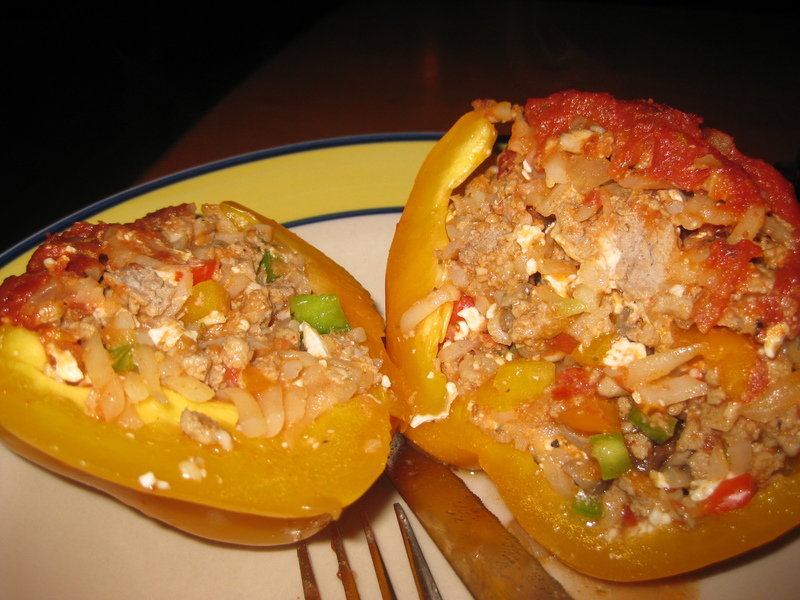 The other night my mom was telling me all about the stuffed peppers she was making that night for dinner. We only had them once in awhile at home growing up, but they are sort of a dressed up meatloaf. Any extra stuffing mixture can be put into a loaf pan and baked alongside the peppers. Here’s my version, inspired by my mom. 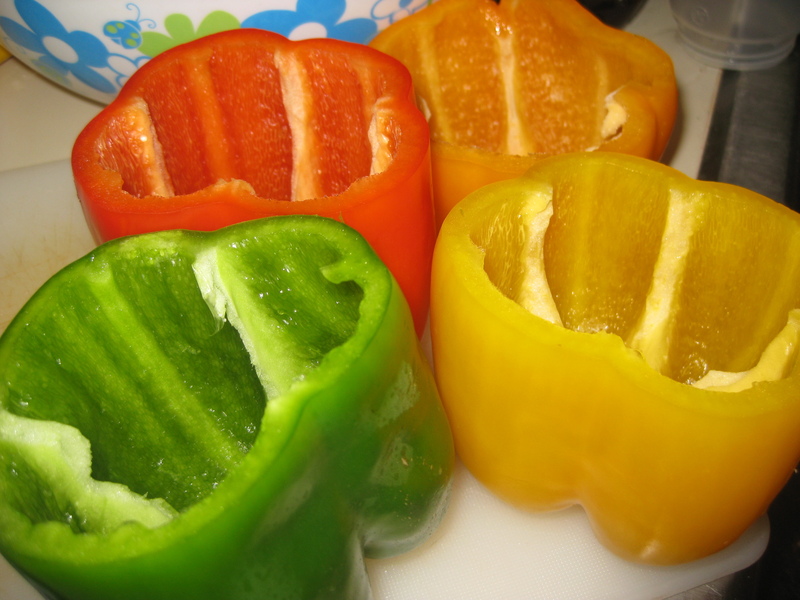 Cut the tops off of the bell peppers. Stand them up in an 8×8-inch baking dish. Reserve the tops. Heat the olive oil in a large non-stick skillet over medium-high heat. Add in the ground turkey and start to brown. 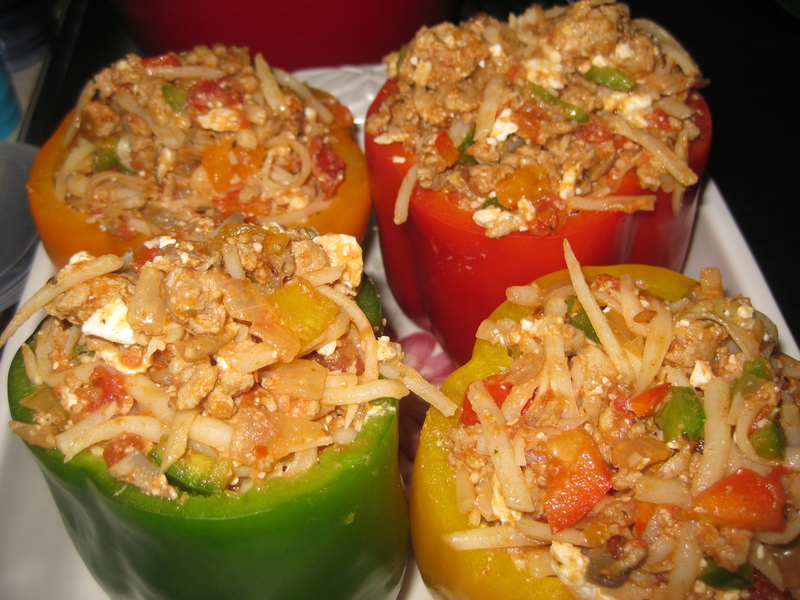 Chop the tops of the bell peppers, and combine with the chopped cubanelle, onion and mushrooms. Add the chopped veggies into the skillet with the beef. Continue to brown and cook. Stir in the can of tomatoes, and cook until most of the liquid has evaporated. Mix in the feta and potatoes to the turkey mixture. Stuff the peppers, and top with the tomato sauce. Add a little water or stock to the bottom of the baking dish. Bake 20-30 minutes, or until the peppers are starting to soften. Sometimes the mint in the market looks so fresh and mintacular that you think, “Mojito, anyone? ?” And then you go home and whip up a pitcher to drink with family and friends out on the deck. This will serve at least 4. You could make it kid-friendly by replacing the rum with 7-up. 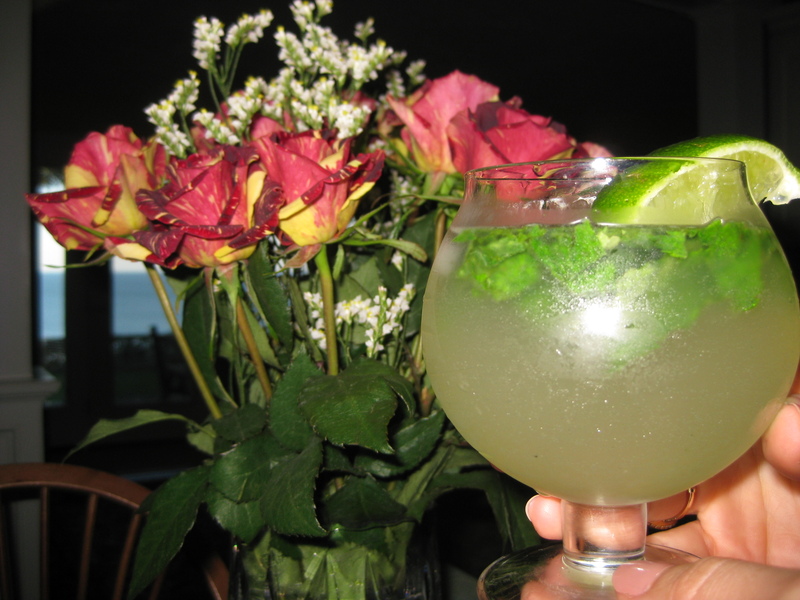 In a serving pitcher, combine mint with the lime juice and sugar. Muddle together by mashing with a wooden spoon; this release all those wonderful minty oils and should smell pretty darn good. Add some ice. Pour into glasses and garnish with the lime wedges! Drink responsibly, as always. When I’m nervous or stressed, I like to bake. This is great news for my friends, because I usually like to give away whatever it is that just popped out of the oven. The other day was a day for making brownies. These are not super sweet, but they are rather dense and chocolately. You will like them; I promise! Preheat oven to 350 degrees. Line an 8-inch square baking dish with tinfoil and spray with non-stick spray. You will want the dish to be at least 2-inches deep. 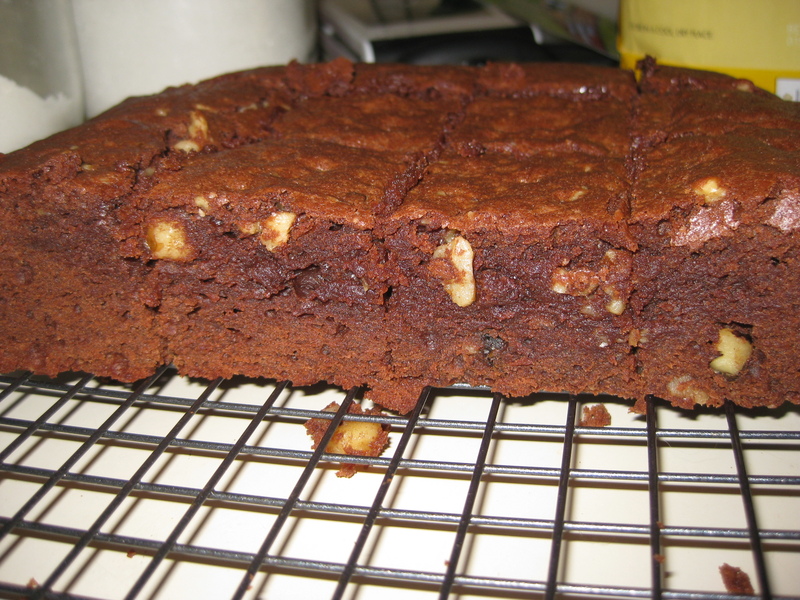 In a heavy, non-stick saucepan, melt the butter and chocolate over low heat until smooth. Remove from heat and allow to cool slightly. In a large bowl, combine the sugar, eggs, vanilla, and almond extract. Stir in 1 T of the melted chocolate mixture to temper the eggs. Stir in another T of chocolate. Stir in a 3rd T of chocolate. Slowly stir in the remaining chocolate mixture. Mix in the flour. Stir in the nuts. 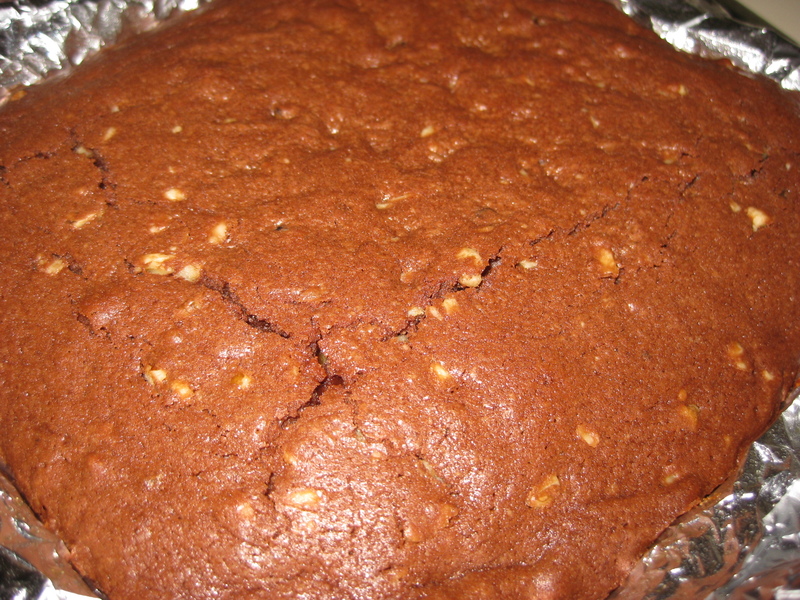 Bake about 40-50 minutes, or until the top is set and the sides just begin to pull away. Cool completely in the dish on a cooling rack. Invert, remove paper, slice and serve! You are currently browsing the Muffin Bites blog archives for October, 2010.